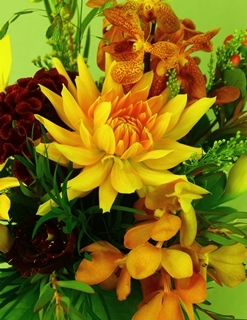 Bellingham WA Florist - Bellingham Flower Shop - About Rebecca's Flower Shoppe, Bellingham, WA. Bellingham's best florist. Independent Florist, Bellingham WA Flower Shop. Flower delivery to Bellingham, WA and Whatcom County. Rebecca's Flower Shoppe is located at 1003 Harris Ave. in the lovely Fairhaven District of Bellingham, WA and serves all of Whatcom County. Rebecca's Flower Shoppe offers excellent personalized floral arrangements and florist services intended to appeal to anyone appreciating flowers and related items. We are an independent brick and mortar Bellingham florist not affiliated with any of the generic online wire order companies because we believe that every client deserves distinctively beautiful flowers creatively designed and delivered with absolute personal and professional integrity. We are also independent so that our clients receive full value for their money and not for the wire service to skim over 50% when all of the fees to florists involved with them are added up. Rebecca's Flower Shoppe's floral designs emphasize distinction, beauty, and sophistication in our floral selection and arrangements. When you want exquisite flowers for any occasion come to Rebecca's Flower Shoppe to experience for yourself the most creative Bellingham florist shop. Rebecca's Flower Shoppe also offers indoor plants, flower and gift baskets, Lucky bamboo, dried flower wreaths, original glass art, orchids, hand made soaps, flower pots and baskets. We also carry quite a selection of rocks, minerals, crystals, and seashells. Rebecca's Flower Shoppe believes in being an active supporter of our community and some of its many worthy organizations. Among those are the Whatcom Humane Society, Whatcom Hospice, Whatcom Chorale, American Red Cross, Bellingham Schools, Whatcom Land Trust, Elks Club, WWU, U&Me Dance, and Wendy Setter Dance Studio.